Old Radios: This happens to be a true story-once in awhile I'll write one. 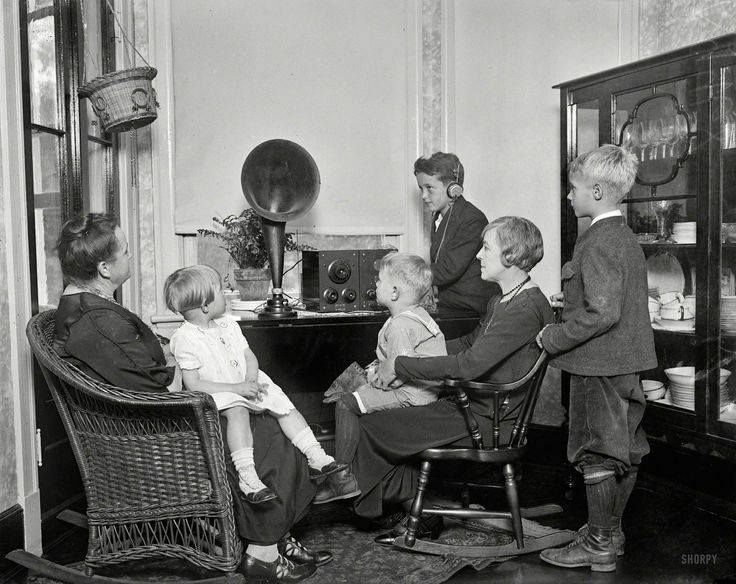 Just prior to leaving on our trip, a friend had posted a photo on Facebook of a family gathered around an old radio listening to it. I thought, gee that's a neat portrait of the togetherness that the early electronics created. Grandma, Mom and the grandkids gathered about the new-fangled device, enjoying it together. Note: Russ pointed out if they had a speaker, the boy wouldn't need to be wearing headphones. Glimpse at the simplicity of the early radio. In an interesting twist, I happened to be looking for Russ a birthday present; March 5th is his birthday. I saw the old photo, thought I'd order a print, and surprise him with it on his birthday. I forgot about it; we went on the trip. We found on our expedition, among other things, the radio (shown above). Several days after returning home, the print arrived. As I looked at it, I noticed the radio looked familiar. It was a 1921 Westinghouse RC--the same radio we found on the trip! How about that? Have you had any interesting experiences such as this? Please send them along on the Comments Form. I'd love to share them.